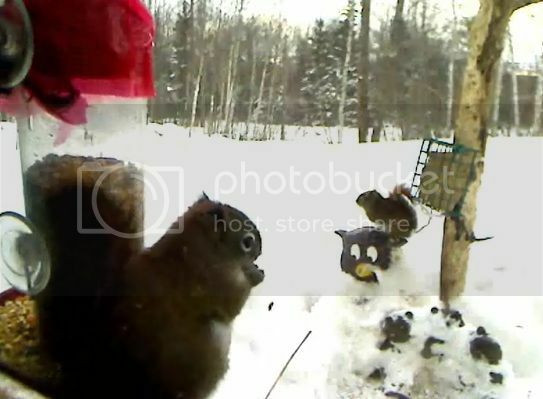 NovaBirds Cam Blog: Nova Squirrel Cam? First of all, HAPPY NEW YEAR! I hope everyone had a fabulous New Year's Eve and wish you a great year ahead! Scram and his buddy pig out. The Nova Birdcam is currently pretty buried in snow. We had quite a blizzard on the 29th-30th of December...and we're now in a cold snap (-20°C with windchill!) so the snow won't be melting any time soon. ﻿﻿Yesterday, the cam was taken over by that pesky little Scram...and this time he brought a buddy along with him! For a good couple of hours, he and his friend hogged all the seed and kept most of the birds away. They must be in a food coma now, as I haven't seen either of them today. Just lots of birds!